どうして葉の背側が木に張り付くように形成されるのだろう？？ Why do leaves of Nepenthes veitchii wind around the tree? Mechanisms of tendril winding in the Cucurbitaceae have been studies. Gerbode et al. (2012) showed that asymmetric contortion of stiff, lignified gelatinous fiber formed asymmetrically in the tendril tissue should contribute to the winding. On the other hand, Wang et al. (2013) proposed that the helical angle of cellulose fibrils at the subcellular level induces the change in helical morphology of tendril, indicating that the change of molecular structure causes macro morphological changes at the organ level. 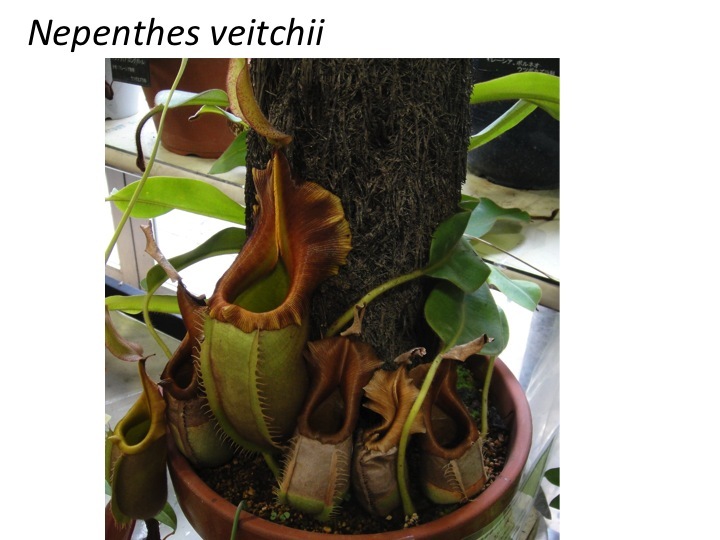 The winding of Nepenthes veitchii is more moderate than that of the Cucurbitaceae and also of other Nepenthes species. the mechanisms may be different and the diversity of winding is one interesting topics in plant evodevo. Gerbode, S. J., Puzey, J. R., McCormick, A. G. & Mahadevan, L. How the cucumber tendril coils and overwinds. Science 337, 1087–1091 (2012). Jian-Shan Wang, Gang Wang, Xi-Qiao Feng, Takayuki Kitamura, Yi-Lan Kang, Shou-Wen Yu & Qing-Hua Qin. Hierarchical chirality transfer in the growth of Towel Gourd tendrils. Scientific Rep. 3102 (2013).